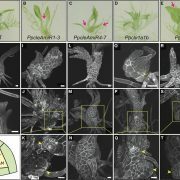 Pattern formation in multicellular organisms is the result of coordinated cell division and cell fate determination. 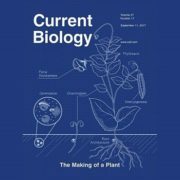 In animals, cell fate is determined mainly by a cell lineage-dependent mechanism, whereas positional information is thought to be the primary determinant of cell fate in plants. 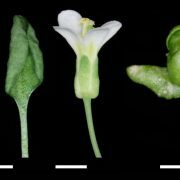 Currently, our understanding of cell fate regulation in plants relies mostly on the histological and anatomical studies on Arabidopsis thaliana roots. 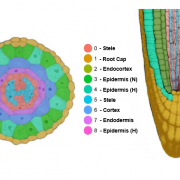 The Arabidopsis root is composed of concentric rings of different cell files with stele, endodermis, cortex, and epidermis arranged from the inside to the outside. 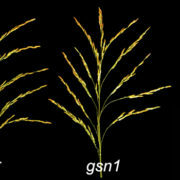 The mobile protein encoded by the SHORT-ROOT (SHR) gene, by directing ground tissue formation, is a key regulator of root radial patterning. Cortical and endodermal cell layers derive from the same cortex/endodermal initial cells in the stem cell niche. SHR activates SCARECROW (SCR), and together both SHR and SCR up-regulate a cyclin that leads to periclinal divisions in cortex/endodermal initial daughter cells. SHR misexpression is able to trigger extra cell division beyond the endodermis leading to the formation of supernumerary cell layers. By investigating gene expression in these supernumerary layers, Yu et al. 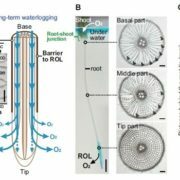 (10.1104/pp.17.00814) have concluded that cell fate determination in Arabidopsis roots utilizes lineage-dependent mechanisms at early stages and positional-dependent signaling at later stages. The inherited cell identity can subsequently be removed or modified by positional information. 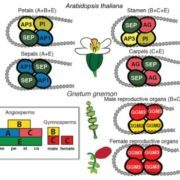 The final identity of a cell type is determined by the synergistic contribution from multiple layers of regulation, including symplastic communication across tissues. 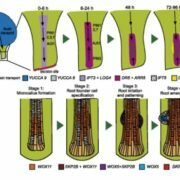 These findings provide new insights into the long-standing question of cell fate regulation and underline the crucial role of symplastic communication between tissues during tissue formation in roots.